Interesting subjects, thin carrier film, perfect register, alternate “handed” designs. 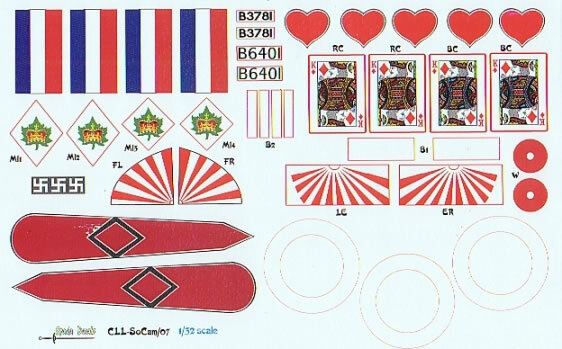 Spada Decals makes a welcome return with an impressive array of new subjects. 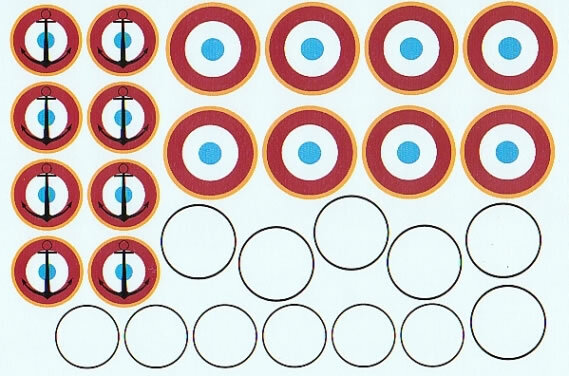 These sheets are printed with a continuous carrier film which requires careful trimming around the item needed. For subjects that have images containing white, the surrounding layer is in this colour. The other designs are printed on a clear background. A lot of the aircraft have emblems on both sides of the fuselage. Many times it is not known if the image was “handed”. To cater for this Spada supply both left and right facing versions which really shows that they have the modellers’ interest at heart. The carrier film is very thin and all of the examples were in perfect register. 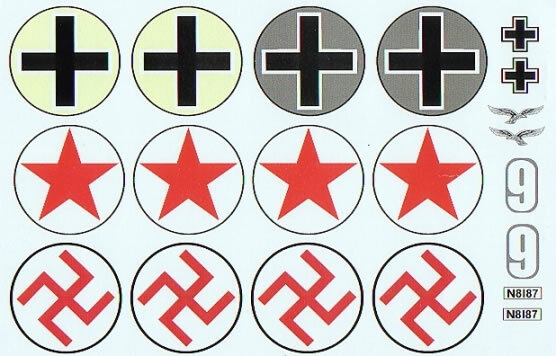 Past experience has revealed that commercial setting solutions work well with these decals. There is no reason to suspect that this batch should be any different but testing on a spare item first is always prudent. 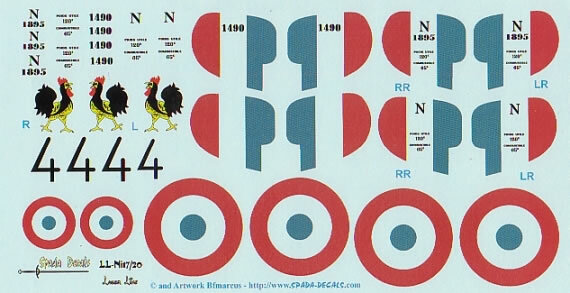 First cab off the rank is three sheets to take advantage of Roden’s recent Albatros D.III in 1:32 scale. 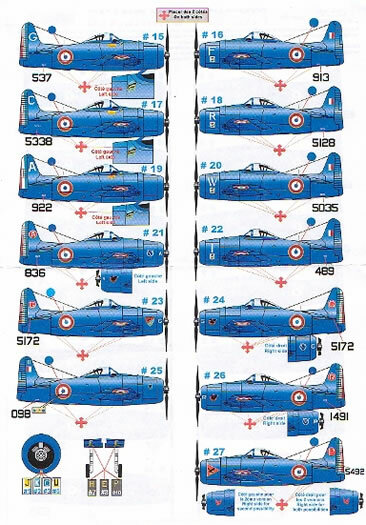 Each gives the modeller a choice of four aircraft to choose from and all have been selected from references that are well respected in the “string bag” community. 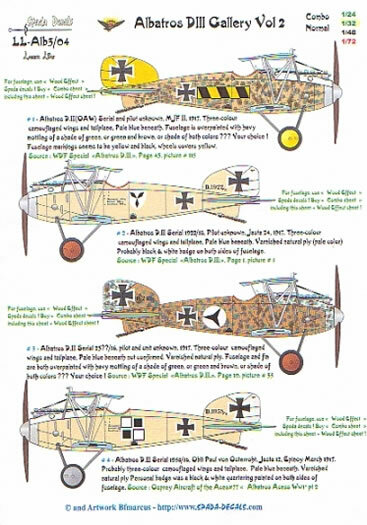 Albatros D.III serial 760/17, flown by Vzfw. Hans Oberländer, Jasta 30, 1917. Albatros D.III serial unknown, flown by Offz. Stv Friedrich Altemeier, Jasta 24, 1917. 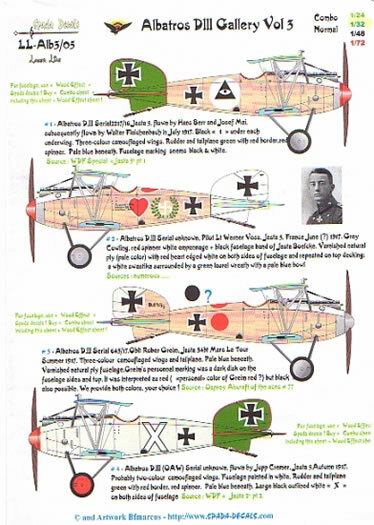 Albatros D.III serial 2217/16, pilots include Hans Berr, Josef Mai and Walter Reichenbach, Jasta 5, 1917. Albatros D.III serial unknown, flown by Lt. Werner Voss, Jasta 5, 1917. 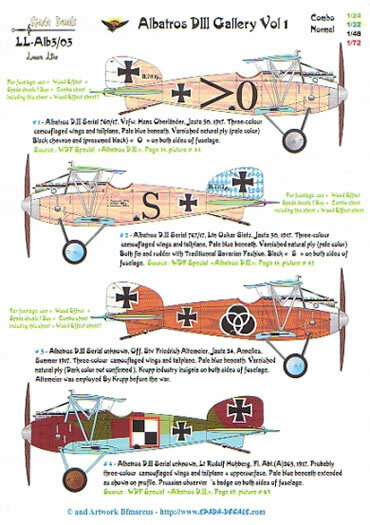 Albatros D.III serial 643/17, flown by Oblt. Robert Greim, Jasta 34, 1917. Naturally the modeller should be aware that some of the subjects will require kit modifications to the standard kit to accurately portray their favourite aircraft. 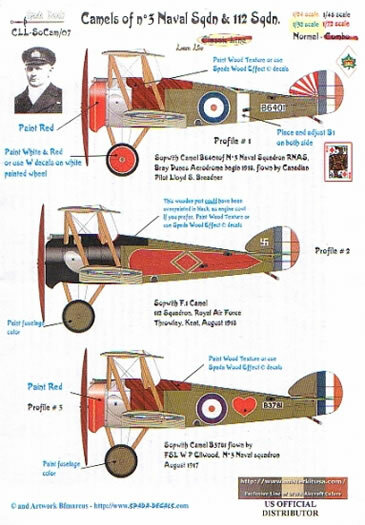 Sopwith Camels are not forgotten and a trio of them are present on the next release. They are also in 1:32 scale and once again, the subject chosen may require some scratch building. 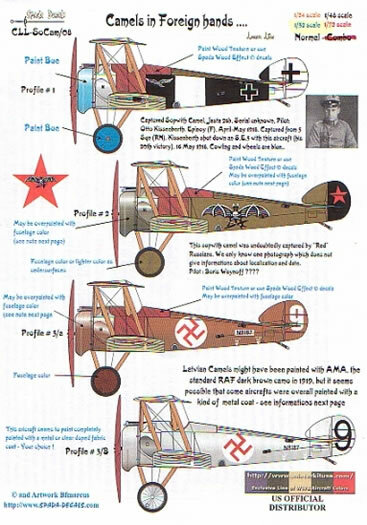 Sheet CLL-SoCam/07 Camels of No.3 Naval Sqn. & 112 Sqn. Sopwith Camel B6401 of No.3 Naval Squadron RNAS, Bray Dunes Aerodrome 1918, flown by Lloyd S. Breadner. Sopwith F.1 Camel, 112 squadron, Royal Air Force, Kent, 1918. Sopwith Camel B3781 flown by FSL W P Ellwood, No.3 Naval Squadron, 1917. For those that enjoy portraying aircraft in foreign hands, a delightful selection of four aircraft is also available in the above scale. There is quite a bit of speculation about some of the schemes and the instructions suitably note this. Captured Sopwith camel, Jasta 26, serial unknown, flown by Otto Kissenberth, April-May 1918. Captured from 3 Sq. (RN). Kissenberth actually shot down a SE 5 in this aircraft! (20th victory). Sopwith Camel believed to be captured by “Red” Russians. Some speculate the pilot could have been Boris Waynoff. Latvian Camel, speculated as being painted in overall RAF dark brown. Latvian Camel, with some saying overall silver dope, others quoting natural linen. 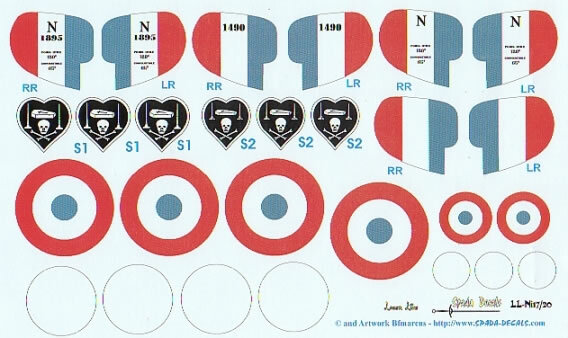 The Nieuport 17 has always been a favourite amongst World War aircraft followers and these three subjects promise to make an impact in 1:32 scale. Nieuport Ni17, serial N1895, flown by Lieutenant Charles Nungesser, Escadrille N65, France early summer 1916. Nieuport Ni17, serial N1490, flown by S/Lt Ch. 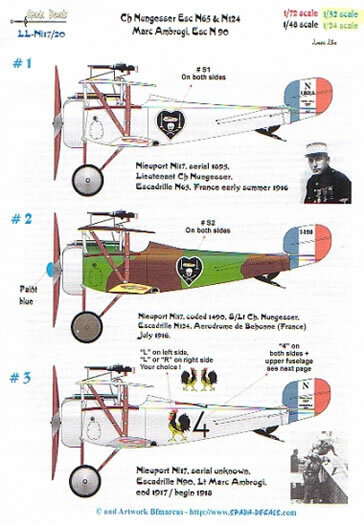 Nungesser, Escadrille N124, July 1917. Nieuport Ni17, serial unknown, Escadrille N90, flown by Lt, Marc Ambrogi, 1917/ start 1918. 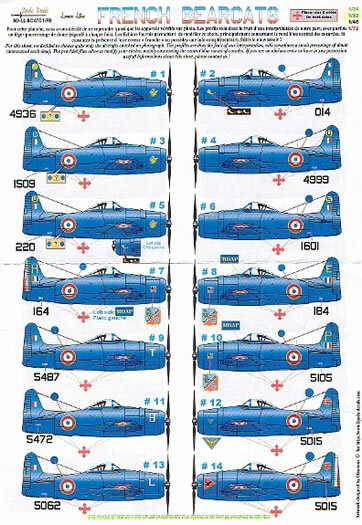 Next up in this large scale is a sheet for French Hellcats. 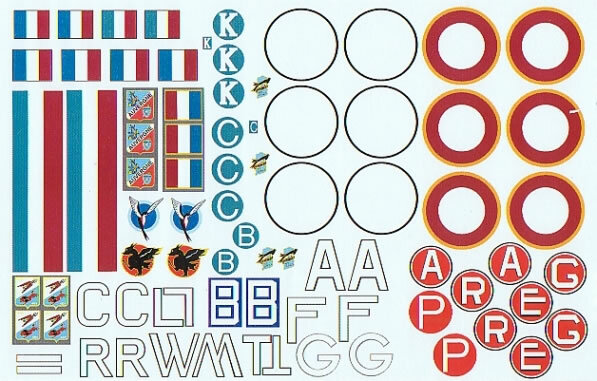 From the 10 choices available, it is possible for the modeller to build at least two complete aircraft. An astonishing 27 options are presented on this sheet, providing the large scale builder with a plethora of choices. 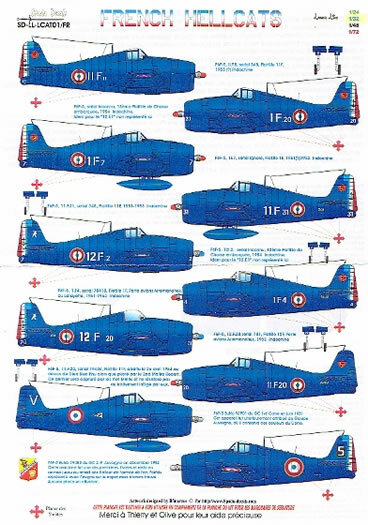 Some of the aircraft chosen have controversial schemes and where this occurs, mention of it is made in the instruction sheet. This is certainly another interesting collection from Spada. 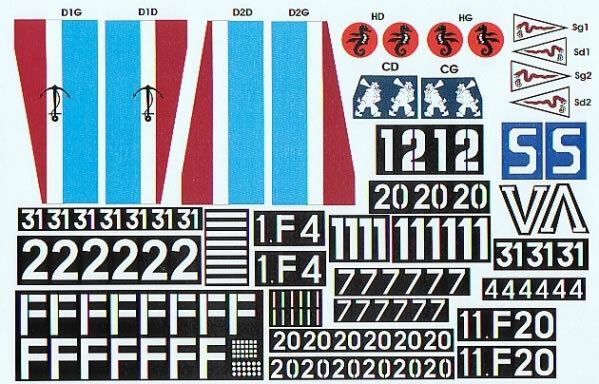 They are keen to please the modeller by supplying extra decals where doubt exists in a particular subject. A list of references used can be found on most of the instruction sheets so the purchaser can check the validity of the aircraft’s scheme for themselves. The quality of printing is excellent and all the modeller needs is a steady hand to cut them out.